The Wizard of Oz lives on in this gorgeous LightCell. Features a lighted frame and 2 pieces of actual film from the movie! Suitable for tabletop display or wall mounting. Limited edition of just 500 pieces! The Wizard of Oz lives on in this gorgeous LightCell. Limited to only 500 pieces, it includes an acrylic print and 2 clips of actual film! 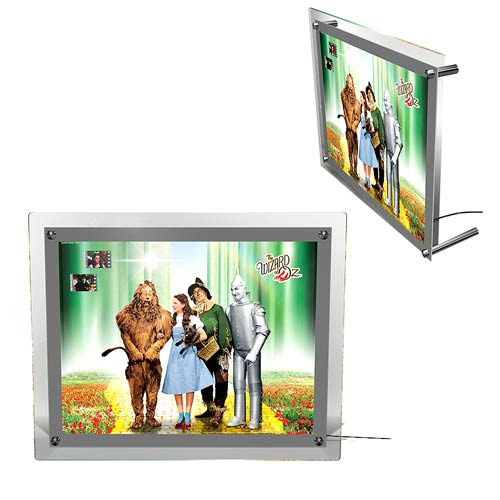 Scratch, UV, and water resistant, the Wizard of Oz Acrylic LightCell Film Cell comes with a power adapter and LED lamp. It measures 16-inches wide x 12 1/2-inches tall, ready for tabletop display or wall mounting using the included pins. This is a can't-miss collectible for fans of The Wizard of Oz! Relive one of the most beloved movies of all time, The Wizard of Oz, with this rare LightCell - a limited edition of only 500 pieces! The LightCell is a translucent yet vibrant acrylic film print that boasts 2 clips of 35 mm film from the movie. This modern collector's item is truly a piece of art, with an elegant frame and vibrant print that shines when the frame is switched on. This amazing LightCell is also incredibly durable; it's scratch, UV, and water resistant, and comes with a power adapter and an LED lamp with a life of about 30,000 hours. The image is permanently fused to the polymeric print, which measures 14-inches wide x 10-inches tall, within a frame that measures 16-inches wide x 12 1/2-inches tall. "It's Toy Paradise without a doubt. Love this website. " "It's Toy Paradise without a doubt. Love this website...."